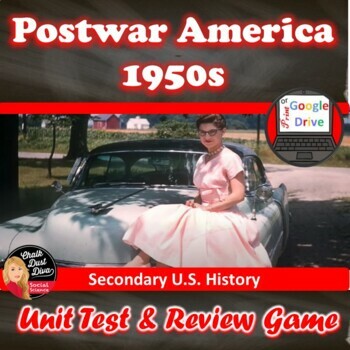 This product includes everything you need to teach a 12-day unit on “Post-WWII American Society” (The 1950’s) for your secondary U.S. History class. Common-Core aligned!Purchase in BUNDLE and you will automatically save 20% off of each product! A pacing guide and detailed lesson plans are included! 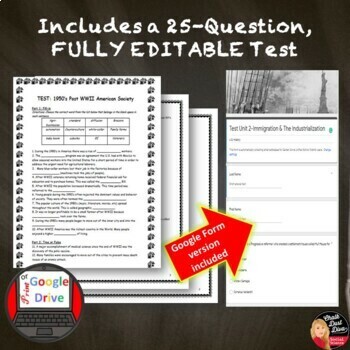 This product includes both an EDITABLE unit exam and Bingo review game for the Unit: 1950’s (Post World War II) American Society. The Unit test includes 10 vocabulary fill-in, 10 True & False and 5 Multiple-Choice. KEY is included. 1. Trace the growth of service sector, white collar, and professional sector jobs in business and government. 2. Describe the significance of Mexican immigration and its relationship to the agricultural economy, especially in California. 3. Examine Truman's labor policy and congressional reaction to it. 4. Analyze new federal government spending on education (including the California Master Plan), defense, welfare, and interest on the national debt. 5. 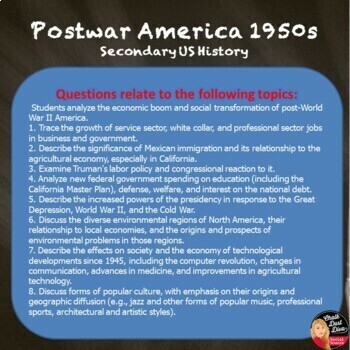 Describe the increased powers of the presidency in response to the Great Depression, World War II, and the Cold War. 6. Discuss the diverse environmental regions of North America, their relationship to local economies, and the origins and prospects of environmental problems in those regions. 7. Describe the effects on society and the economy of technological developments since 1945, including the computer revolution, changes in communication, advances in medicine, and improvements in agricultural technology. 8. Discuss forms of popular culture, with emphasis on their origins and geographic diffusion (e.g., jazz and other forms of popular music, professional sports, architectural and artistic styles). You can find this product in my BUNDLE – 1950’s America Purchase in BUNDLE and save 20%! EMAIL LIST Get a FREE product that includes 70 teaching strategies!